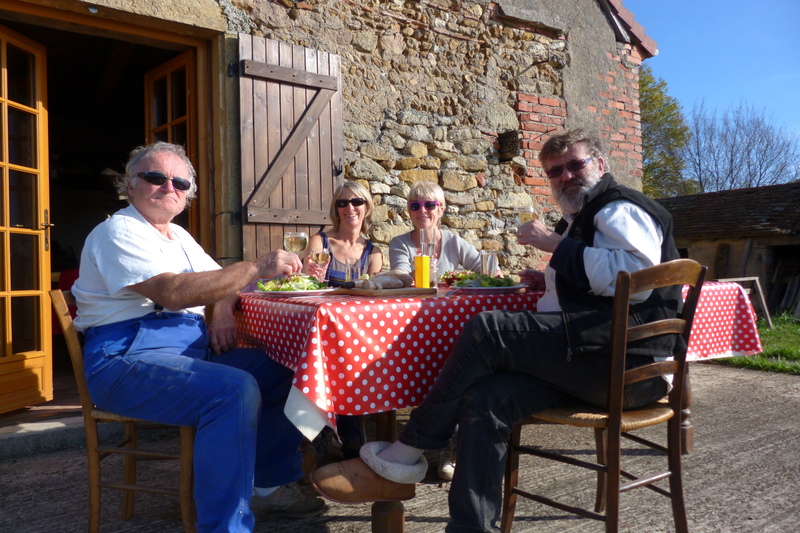 Peta and Bryan invited us back to France, to help close up the house for the winter. 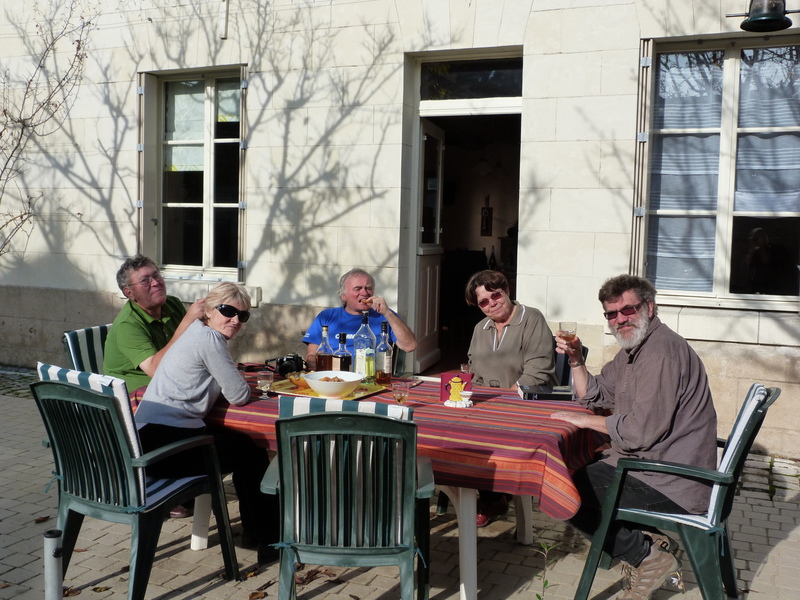 The trip coincided with a visit to friends in the Loire area, in a small village called Restigne. 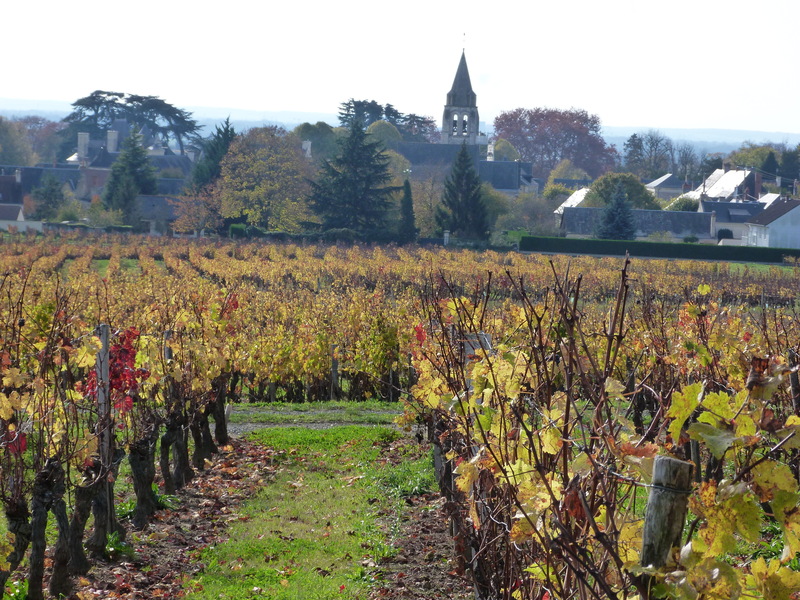 We were thrilled to be invited to see another part of France with new culinary, and vinicultural, treasures. 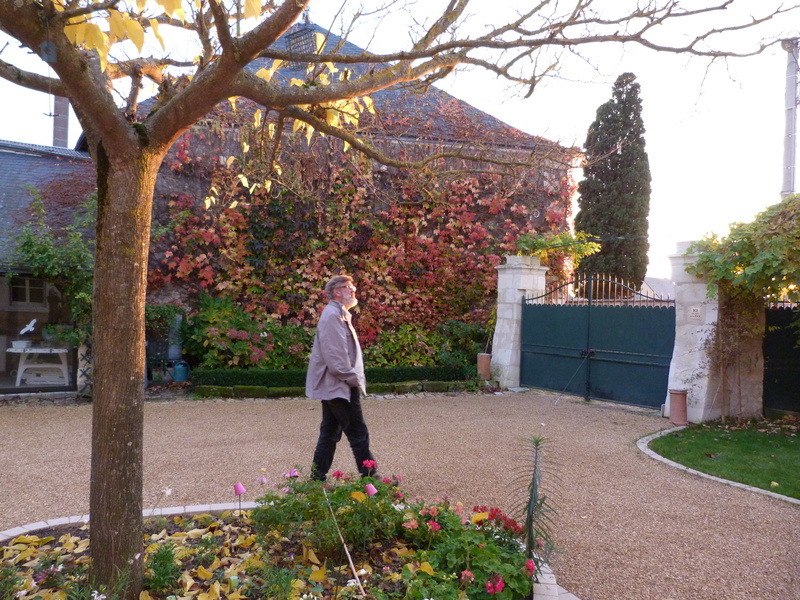 Françoise and Pierre live in a house that they have marvelously restored, complete with courtyard, gardens and guesthouse. Restigne is only several streets long and surrounded by vineyards. 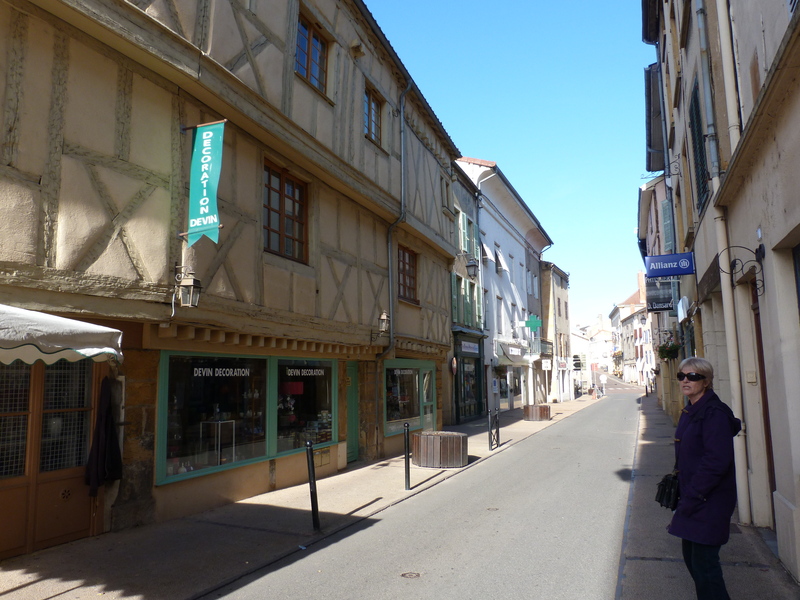 The nearest city is Tours, and Françoise offered to take us there so that we could go to a craft show to see the work of local artisans. I have participated in a number of craft shows myself, and I was really intrigued to see the similarities, and the differences, at L’Art au Quotidiens in Tours. Amongst the many wonderful potters, jewelers and clothing designers were fine furniture makers and restorers able to appropriately re-paint or re-plaster your 16thcentury home. The show was housed in the Vinci Centre International de Congrès, a contemporary building in the centre of town. In the middle of the building there is a large, ultra modern theatre, which was converted to a restaurant for the duration of the craft show. Large tables were set up on the stage where we had a lunch of an extensive salad buffet, hot entrees and seemingly endless glasses of white and red wine. A pianist played American jazz standards on a keyboard set up in the theatre seats. The French really do up a craft show in style. 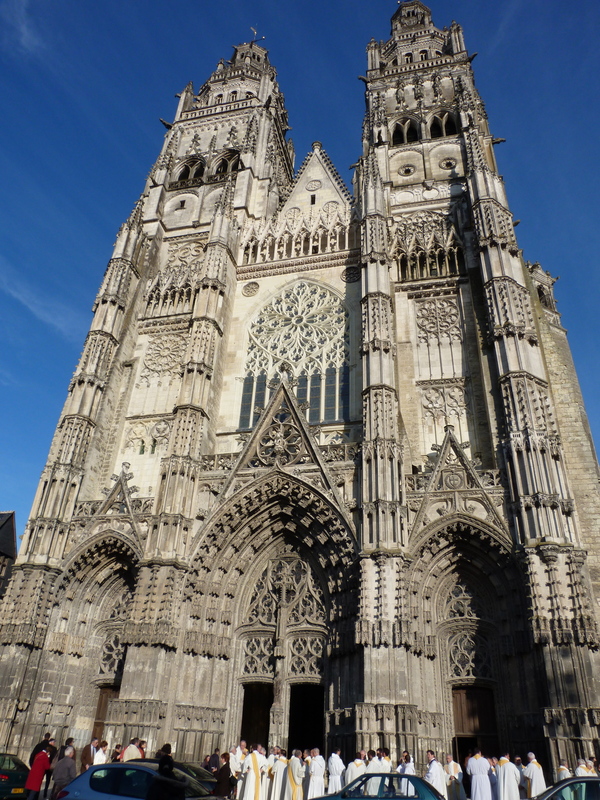 I have always wanted to visit Tours because of a beautiful manuscript that I studied many years ago, done by Alcuin of York in the 9th century at the monastery of St. Martin of Tours. It is one of the most graceful of the Carolingian manuscripts and is one of the reasons why humanist lettering styles are as appealing as they are. Tours did not disappoint. 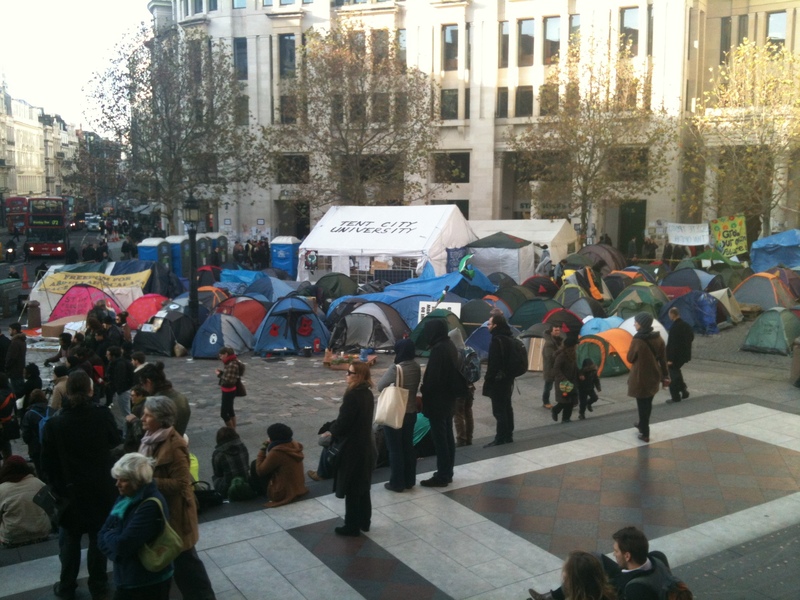 It has a lovely old centre and on this warm November bank holiday (Armistice Day) there were hundreds of people out walking. 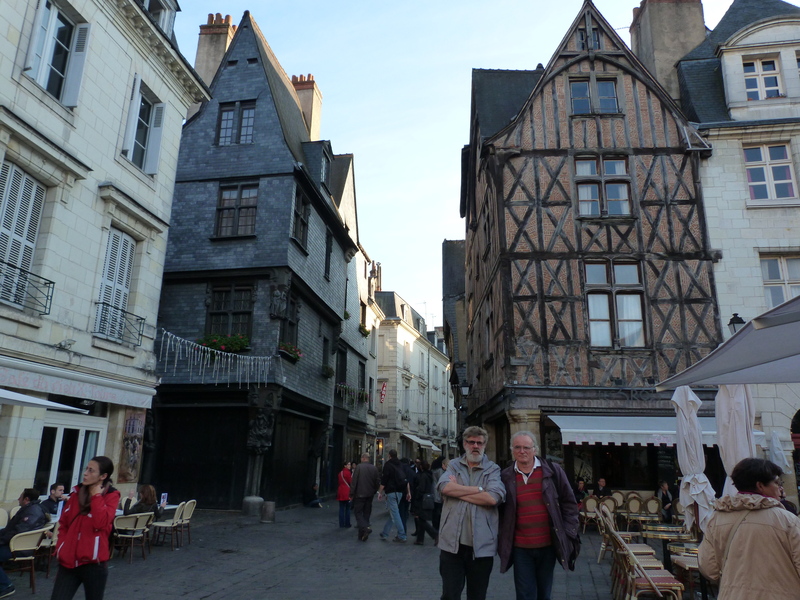 Françoise told us that people are always out strolling in Tours. It’s a very friendly atmosphere. We stopped for coffee in the square, so that we could watch the world pass by. Back in Restigne, the village is only large enough to support a single Boulangerie, a Charcuterie and a small chapel. 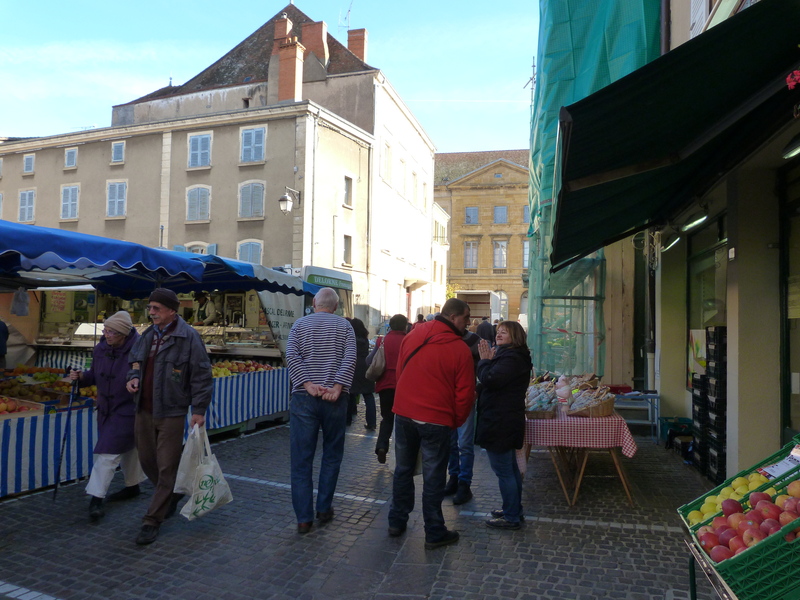 But once a year the village is home to a mammoth Marche des Puces, and we have come to help Françoise organize her stall. But before we got started with collecting treasures from the attic and guest house, Françoise took us to see the caves outside the village. 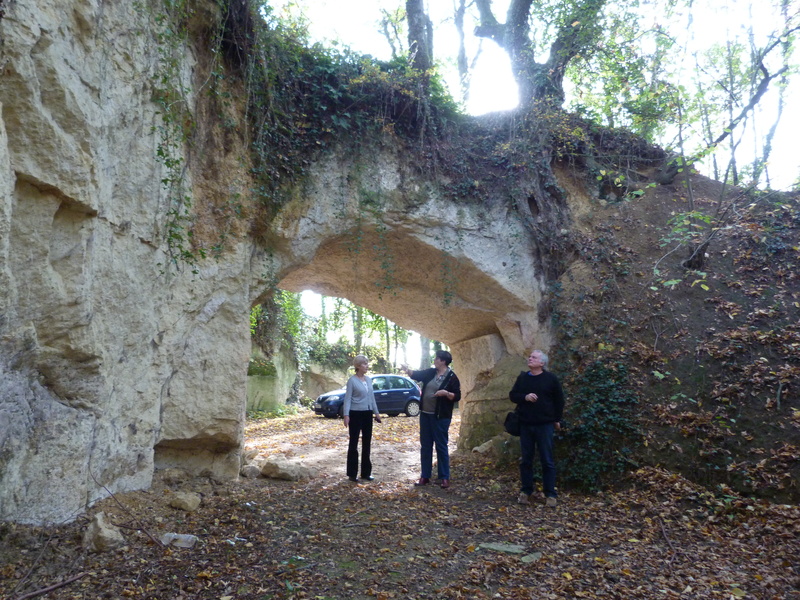 Seven hundred years ago, when people started building in this area, they found large deposits of limestone from which they could easily cut blocks for their houses and Chateaux. They soon realized that when they took the blocks out, they were creating useful spaces. These spaces became caves used for storage, and in times of war, entire villages hid in the caves with their livestock. 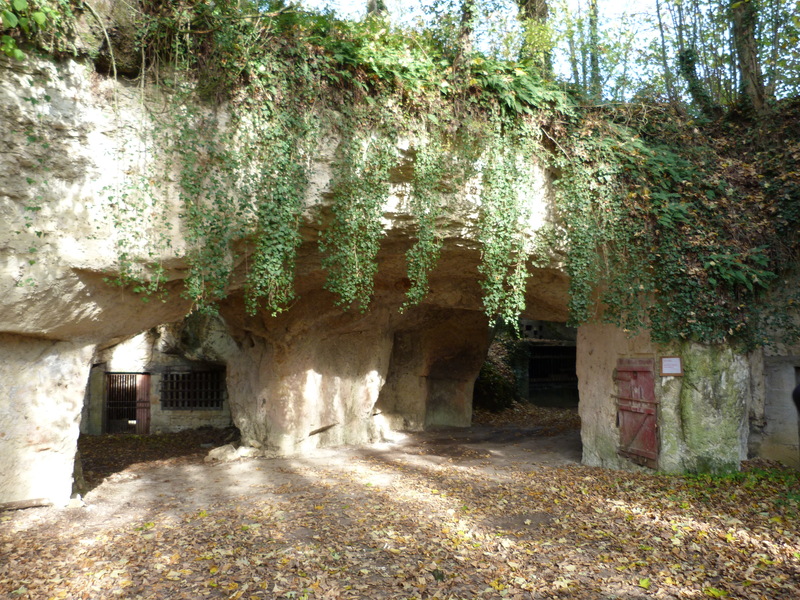 Today, the caves are still in use by the local vitners. Thousands of bottles can be stored at perfect temperatures. Aside from wine storage, caves are also used for a huge wine industry, as well as large (and rather legendary) parties and often for extra living spaces. 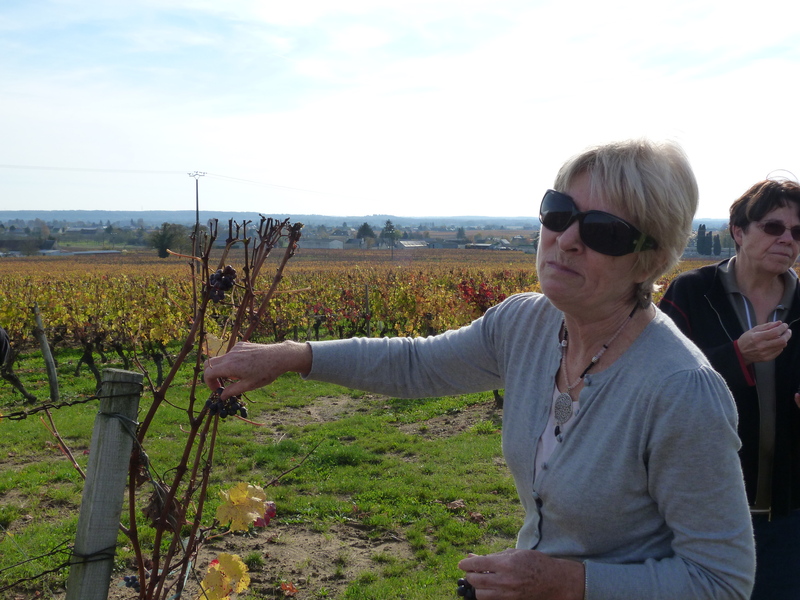 Françoise took us out of the village. There are vineyards everywhere. As far as the eye can see in all directions. There are a few bunches of grapes left on the vines. They are sweet and warmed in the autumn sunshine. 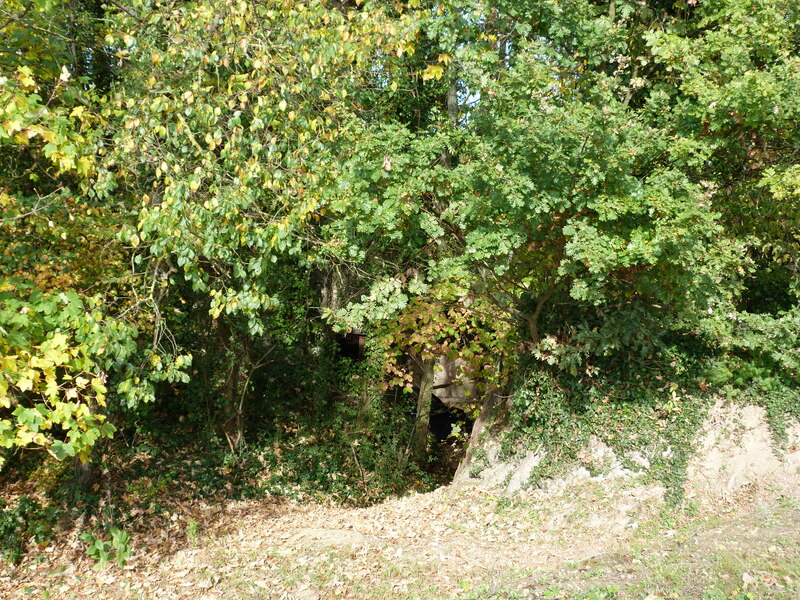 Along the sides of the fields, invisible unless you know where to look, are the caves. They are completely hidden away in the landscape. Back at Françoise and Pierre’s, we got a tour of their cave, tucked right under their house. Dinners chez Françoise and Pierre are marvelous affairs, where we sit at table for many hours. 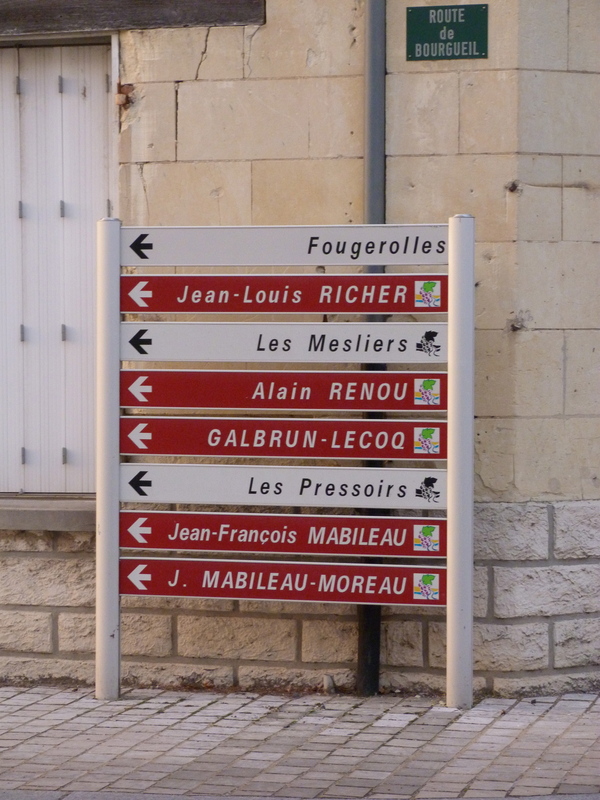 We drank various vintages of the delicious Cabernet Franc that is made in the fields just beyond the village and stored below. There were numerous courses, concluding, always, with cheese platters followed by a dessert. As ridiculous as it may seem to bring cake to the French, I had made my favourite chocolate torte, Bonnie Stern’s California Chocolate Pecan Torte, (thanks to my wonderful friend Hinda who emailed me the recipe just in time) to give to Françoise and Pierre. Thankfully, the recipe is astonishing and the cake came up to their culinary standards. It helped that it was made with good French chocolate. 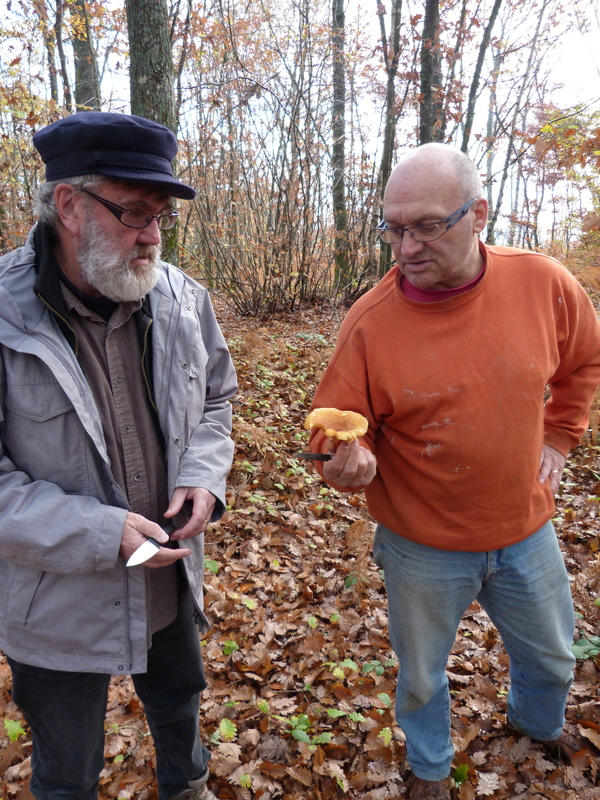 In response to my cake, the next day Pierre purchased a Galette Bourgueilloise – a specialty of the region. Where the chocolate torte was heavy and rich, this was such a light confection that you could almost believe you were eating flavoured clouds. Extraordinary. It, like the wine of the area, has an appellation controlee. Unique to the region, it is a very good reason to visit again. After our travels in Cornwall and Devon, we’ve enjoyed coming back to London. Amongst other things, I’ve been making some connections with people who are working in the field of theatre for youth. 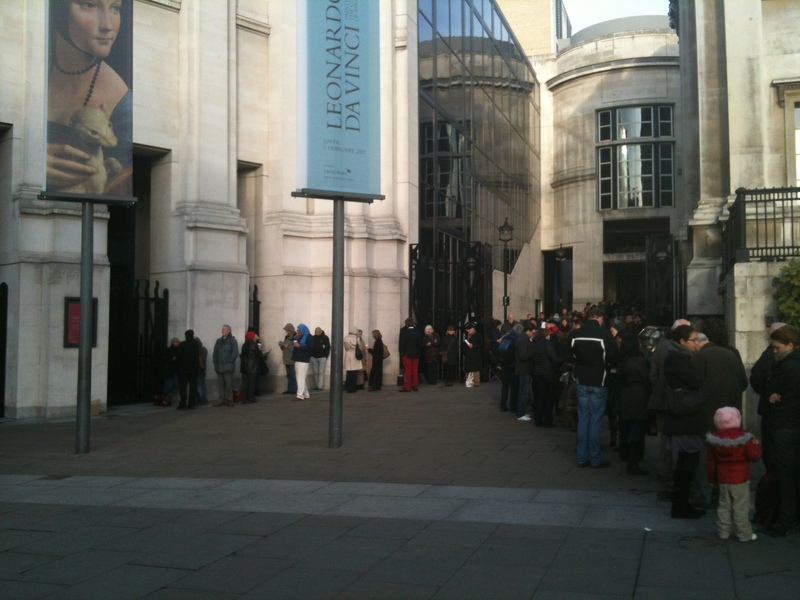 Since 1995, The National Theatre has been commissioning plays for youth age 13 – 19. Over the last 16 years, they have collected a canon of plays by professional writers that provide young people from diverse backgrounds with meaningful ways to explore theatre and their world. At The Ottawa School of Speech & Drama, I have produced 5 of these plays with Canadian teens and I wanted to see how the plays are used with British youth. “Connections” is the annual theatre festival in which U.K. schools and theatre groups present premiere productions of the new plays. As part of the process, directors attend a weekend workshop to meet with the playwrights and facilitating directors. I was thrilled to be invited to attend the 2012 Connections Directors Workshop as an international delegate. 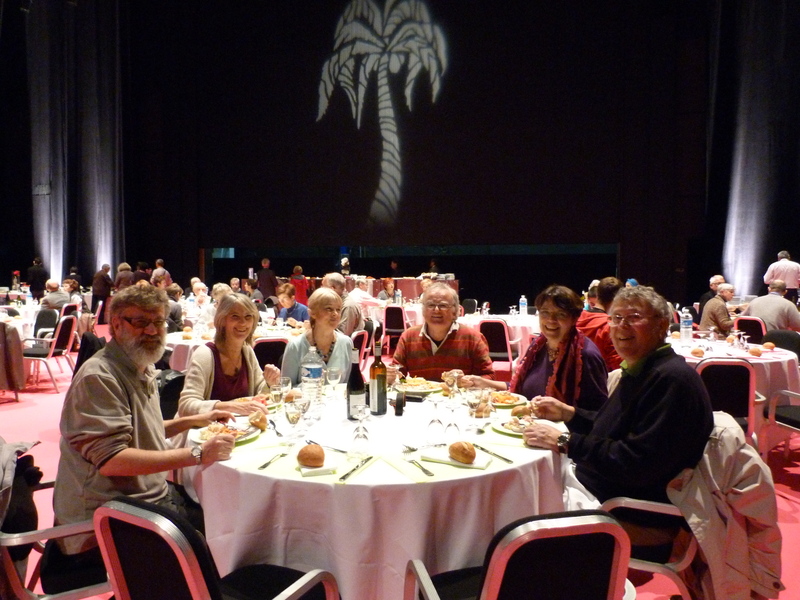 There are ten new plays for 2012 Connections and over 100 directors were attending the workshops. Because I was not focusing on any one play in particular, I got to observe a variety of different writers at work with facilitating directors, all exploring different tasks and approaches to the texts. It was a fabulous day for me. I love creative process. 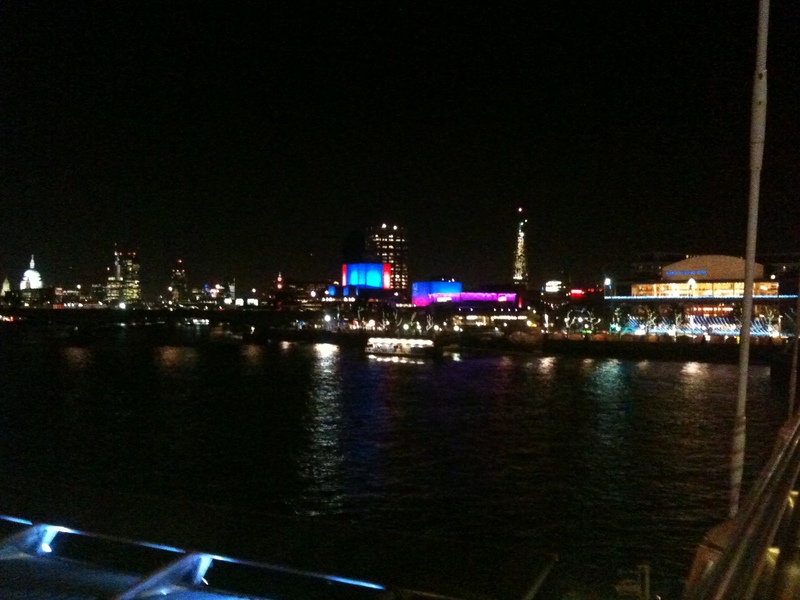 I arrived at the National Theatre Studio near Waterloo station, but wasn’t really sure where to go. I felt a bit at a loss until I met Edward Bromberg from Riksteatern, the national theatre in Sweden (http://www.riksteatern.se/). Edward was also attending as an international delegate, and he took me under his wing. We started with “Journey to X”, by Nancy Harris: “A tale about friendship, a journey and the risks that teenagers take when plunged into an adult world.”* The facilitating director Charlotte Gwinner led the group in a discussion of the themes of the play, examining the world and rhythms of the play, while the playwright was able to answer essential questions and open up the dramaturgical process. From “Journey to X” we went to “Socialism is Great”, by Anders Lustgarten: “The propaganda of the East meets the propaganda of the West in Anders Lustgarten’s play about love, work and power.”* The facilitating director in this workshop, Angus Jackson, worked with the whole group to examine blocking choices and the underlying motivation of the characters, asking the writer for clarification as they went along. During the lunch break, I met up with my UK contact from the National, Anthony Bank, who was the facilitating director for “Prince of Denmark”,by Michael Lesslie”: “Set a decade before the action of Shakespeare’s play, Michael Lesslie’s imagined prequel follows the teenage Hamlet, Ophelia and Laertes as they rage against the roles handed down by their parents.”* Their morning had been spent in a voice workshop, exploring the use of iambic pentameter. 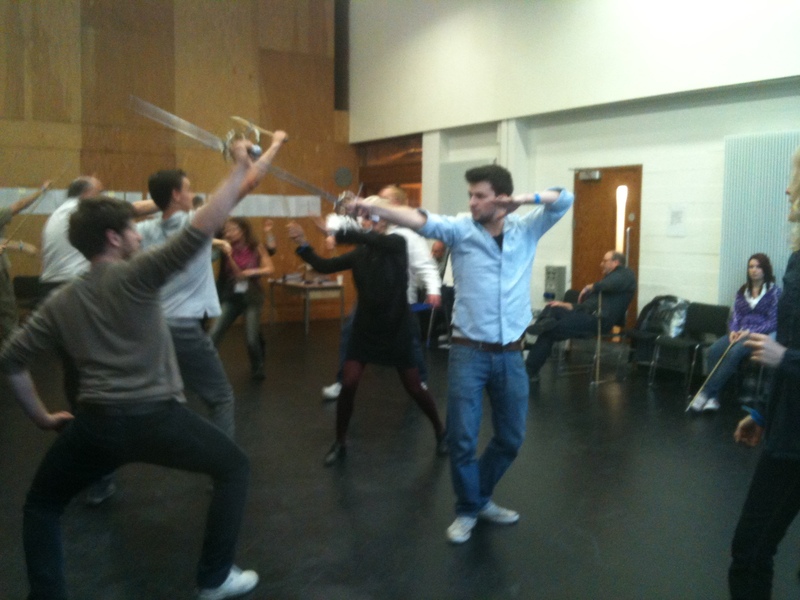 After lunch, fight director Alison De Burgh led us through a basic sword-fighting workshop, always mindful of safety and methods suitable for young people. 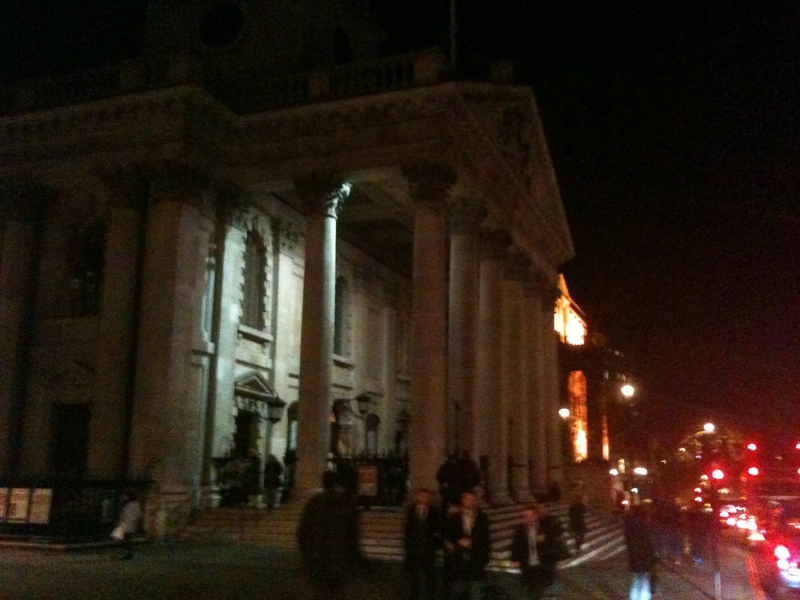 In “Generation Next”, by Meera Syal”: “two young British Punjabis are about to get married. Three times. Through three different generations. Exploring notions of identity and culture with a comic eye, Meera Syal addresses a shrinking world and our growing desire to move towards something or somewhere we think is better.”* A play very specifically for a cast of Asian actors, Meera Syal was there with facilitating director Iqbal Khan working with only one director and his cast of young actors. They discussed personal cultural biographies as they developed an understanding of the historical context of the play. My last stop of the day was “Alice by Heart”, by Steven Sater and Duncan Sheik: “How do we leave childhood behind? How do we close the book? A fresh new rock-musical take on Alice in Wonderland, from the creators of Spring Awakening”. * Writer Steven Sater (yes, he wrote Spring Awakening, one of my favourite musicals) and musical director David Shrubsole had obviously spent a busy day guiding, teaching and answering questions. National Youth Musical Theatre Students, workshopping "Alice by Heart"
The room was filled with directors and about 12 actors from the National Youth Musical Theatre program. It was the end of the day and the facilitating director Timothy Sheader was focusing on transitions and design. Steven Sater answered questions about the writer’s process using a pre-existing text (“Alice in Wonderland”) as a springboard for an exploration of underlying themes. 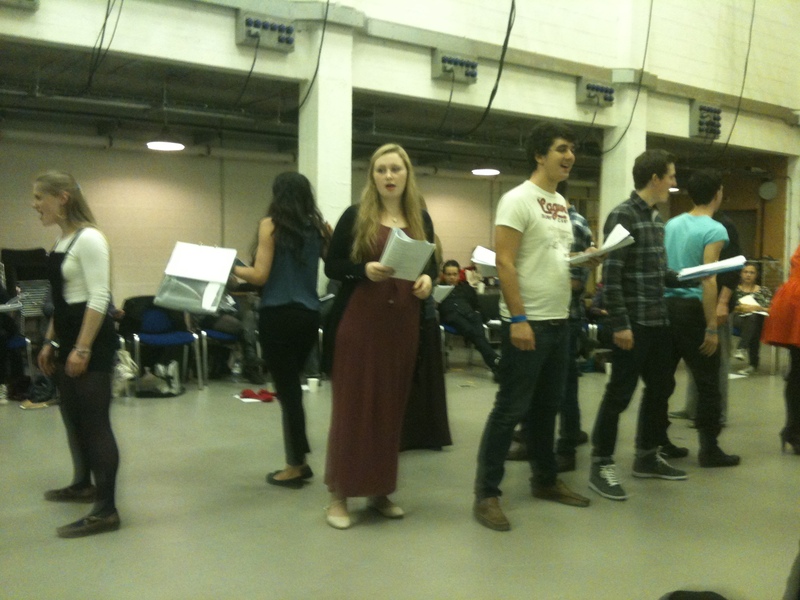 By the end of the day, I had seen bits and pieces of 5 of the 10 new plays. I had met with teachers and directors who were passionately excited about producing these new works with their students, and who clearly relished the opportunity to ask questions of the writers and facilitating directors. It was a rare opportunity. As the workshops ended, Edward invited me to go with Maria Lewenhaupt, his producer from Sweden, as well as delegates from theatres in Norway and Denmark, to see “Shalom Baby” a new drama-comedy at the Theatre Royal Stratford. A wonderfully layered piece, it is a play where the same characters are explored in 1930s Germany and in contemporary Brooklyn. American rap poems were juxtaposed with poignant forbidden love in Germany. It’s a moving and accessible exploration of xenophobia and contemporary blocks to happiness. It was a long day, a great day. A day of more questions than answers. Just what I needed to kick start new thoughts. We had never met Mal Peet and his wife Elspeth Graham before we landed on their doorstep in Exmouth. Mal and Elspeth are writers. Mal and Tim share the same publisher, and have many mutual friends in the world of young adult literature. We were invited to spend a night if we ever found ourselves out their way. So we conveniently found ourselves in Exmouth. Exmouth is on the coast of East Devon and has stunning long sandy beaches. It is a part of the coast where there are wonderful seaside towns devoted to easy beach living. 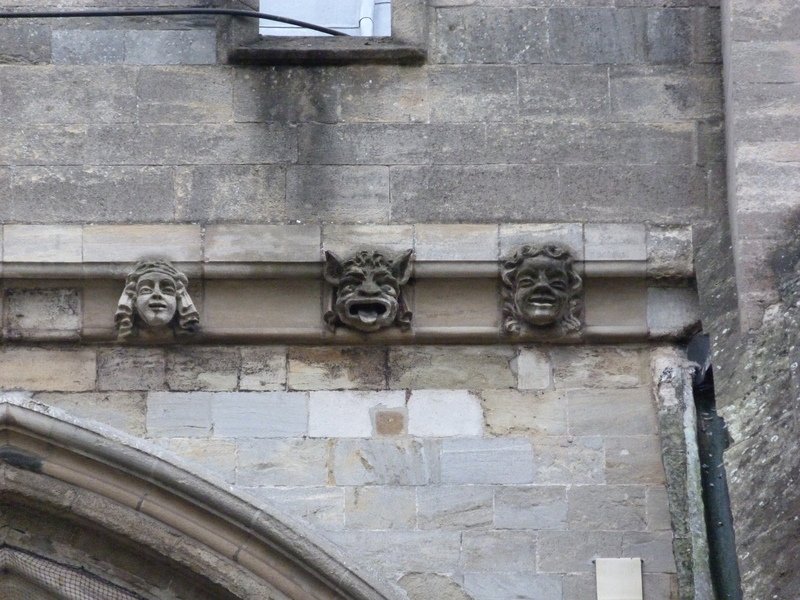 But it is also the entrance to the “Jurassic Coast”, an area of English coastline that stretches from Exmouth in the west to Swanage in the east. The “Jurassic Coast” is recognized by UNESCO as a World Heritage Site because it represents a geological walk through time. In ninety-five miles of coastline, you cover 185 million years of geological development, spanning the Triassic, Jurassic and Cretaceous periods. Too much for one day. It is an area that I definitely want to come back to. Mal and Elspeth live mere blocks from the beach in Exmouth, in a wonderful Victorian house with their too adorable dog Pedro. As Mal cooked, we launched ourselves into riotous discussions about children’s literature, rogue construction, rock and roll, aging and everything we’ve ever encountered in our lives that brought us to this point. 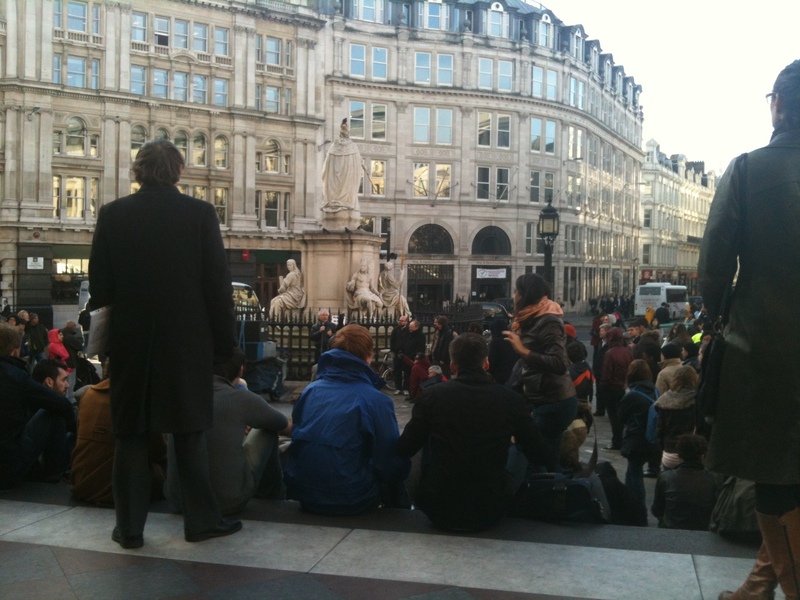 Literature, art, music, theatre, politics – we travelled late into the night solving the problems of the world. The next morning, a little the worse for wear, Mal and Elspeth drove us through the lovely seaside town of Budleigh Salterton (and who could resist that name!) to the extensive salt marsh commons of the Otter Estuary Nature Reserve. We walked along an ancient public walkway bordered by huge chestnuts, oaks and tamaracks to get to the town of Otterton. Otterton is an old Saxon village on the River Otter that used to be the largest settlement in South East Devon. Formerly a port, the river became dammed up with rock and silt several hundred years ago, and the land became agricultural. It is an archetypally beautiful rural town, with thatched cottages, cob and brick buildings and a restored mill. 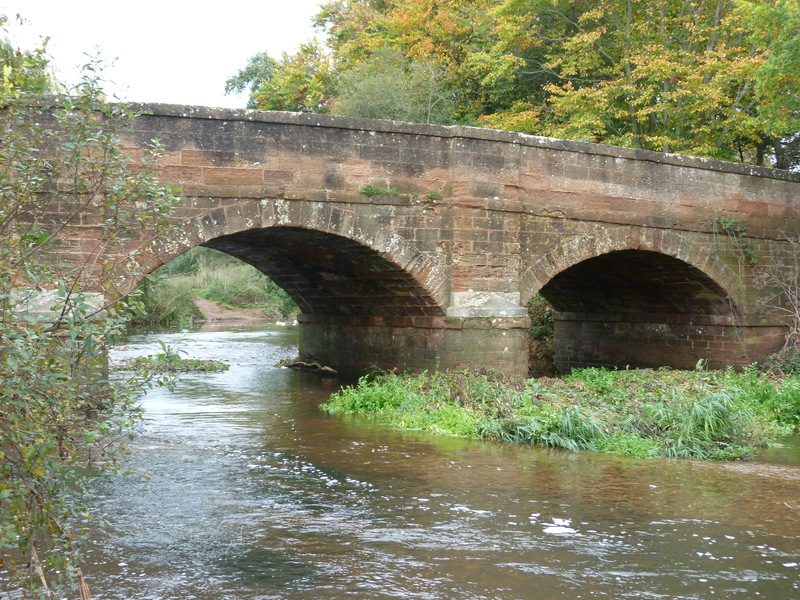 The Otterton Mill, which is open to the public, has been in use for 1000 years. The mill grinds locally produced organic wheat for the breads that they sell in the restaurant bakery. 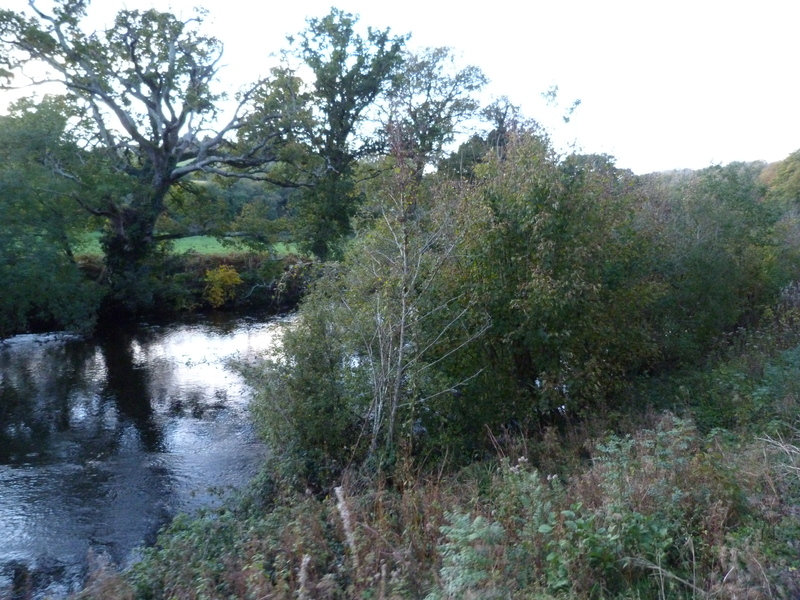 We had coffee in the outdoor café, visited the great local crafts shop (with some of the most exciting and dramatic pottery that I have seen in a long time) and walked back along the River Otter. We had known Mal & Elspeth for only a few short hours, but it felt as though we were lifelong friends as we meandered our way back to Exmouth. 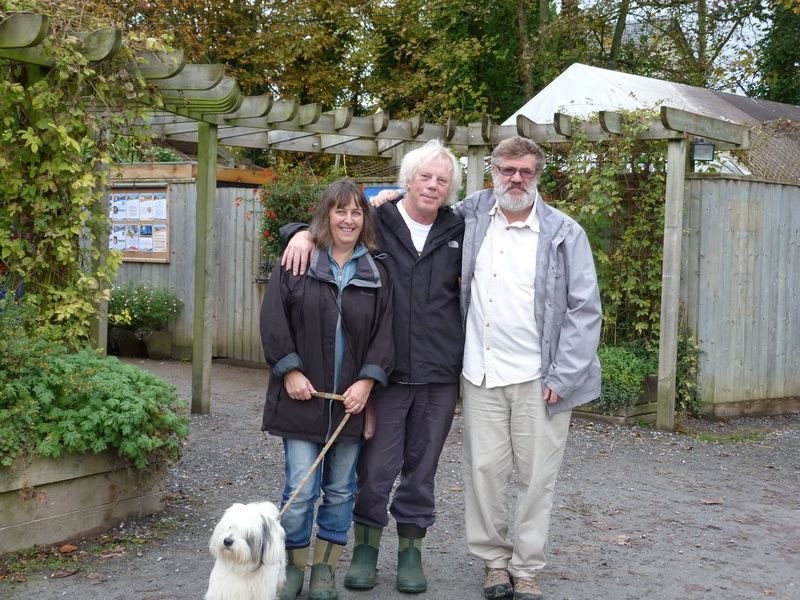 From Exmouth, Mal & Elspeth took us to Exeter where we were to meet up with cousins Penny & Eric. 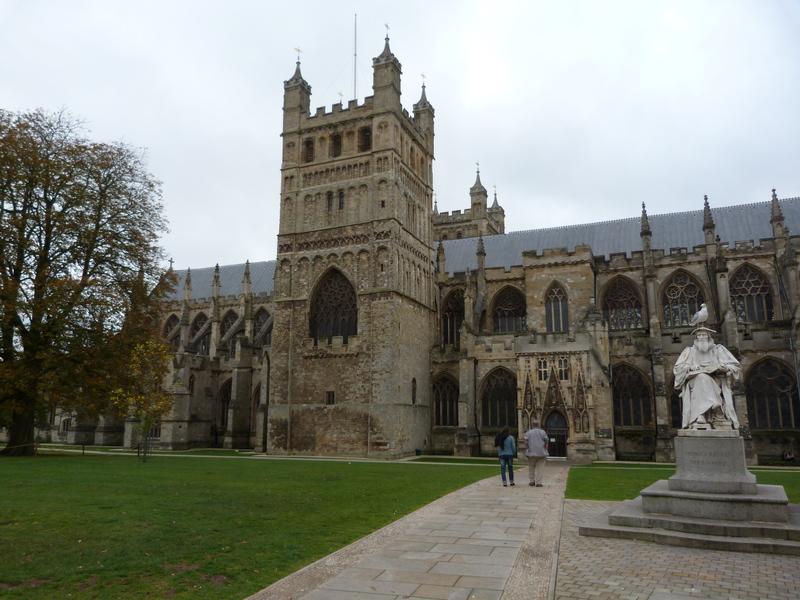 A trading town since 250 BC, Exeter, like Plymouth, suffered greatly during bombing raids in the Second World War. Recently however, the downtown has been revitalized and is now a great blend of contemporary and historical architecture. The downtown shopping district manages to incorporate the remains of the Roman wall, the 15th century St. Catherine’s Almshouse and chapel, and rows of well-preserved houses from every architectural period. 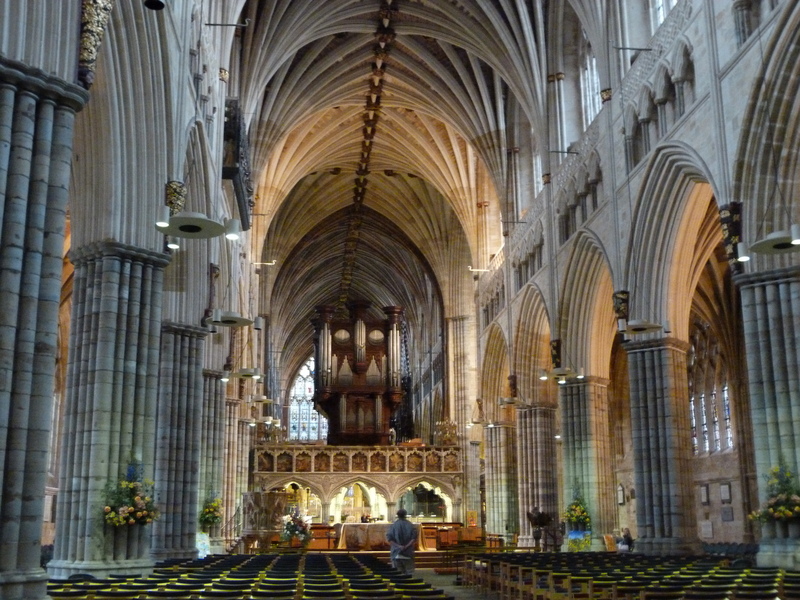 The central feature in Exeter is of course the cathedral. Built in 1170, the cathedral has been added to and restored over the course of the last 900 years and is an imposing and inspiring sight. Inside, we were treated to the sounds of the choir and organ, reverberating on the stone arches. A perfect way to send us off, bidding farewell to Devon, Cornwall and new friends, and heading back up through the country, to London. There is a reason why everyone raves about Devonshire Cream. When you eat it, you feel like you have a direct connection to lush green grass and sunshine. 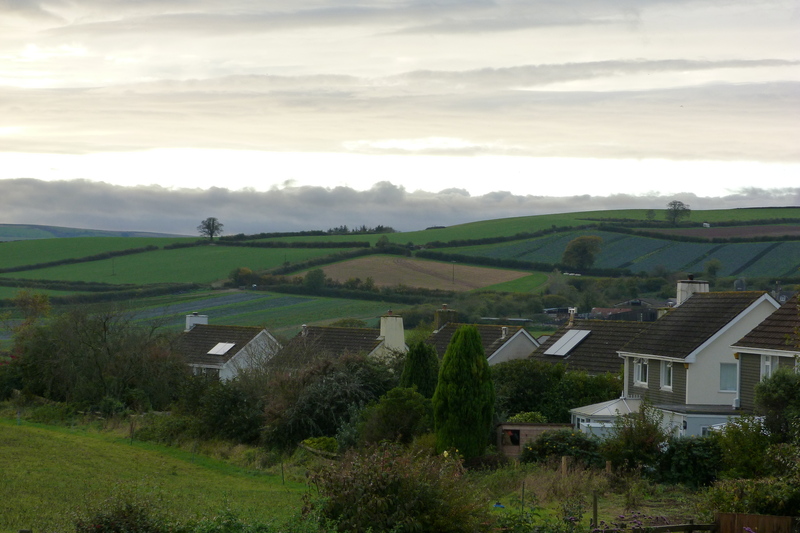 Even though it was the end of October, the fields of Devon were welcoming and the cream was plentiful. Visiting Tim’s cousin Pip and her husband Steven gave us a chance to explore a bit of the Devon countryside. There is a huge organic farm, Riverford, right near their house, with open fields that we could see from the back windows. Riverford runs a kitchen, restaurant, stores and box deliveries of organic produce. After our Looe cottage with no views, it was wonderful to see land in every direction. And after our focus on the fruits of the sea, it was good to come back to such wonderful fresh produce. Pip and Steven live quite close to Totnes. “Did you inhale?” is the common question you get asked after you tell people you’ve been to Totnes. A town of only 7,600, it has a reputation as being a centre for the arts, healing therapies and alternative lifestyle choices. 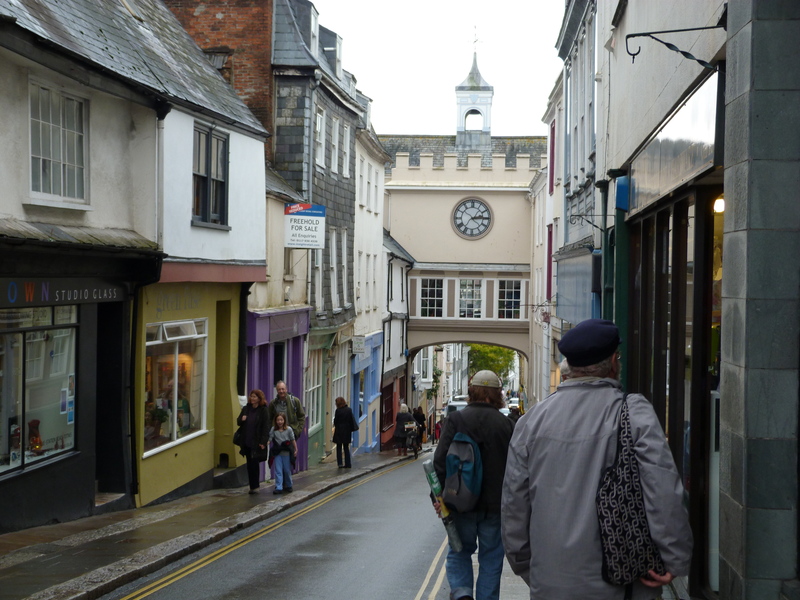 It’s an old market village, filled with “new age” stores, high end fashion, health food and book stores all set in the twisty streets under the shadow of a Norman castle. Our mission, however, was only to find all of the ingredients to make Tim’s wonderful Thai fish stew. Tim’s Thai Fish Stew is our “default” meal – it is quick to make, comforting and delicious. In Totnes, the hardest ingredient to find on main street was the Nam Pla (fish sauce), but once we located a bottle of that, the rest was easy. The meal warmed up a chilly fall evening. The next morning dawned bright and sunny and we were ready to head out for a walk and adventure. We started in the town of Ashburton, a lovely village of about 3,500. Formerly a “Stannery” town (the administration of tin mining), it has great produce stores, interesting crafts and a very welcoming atmosphere. 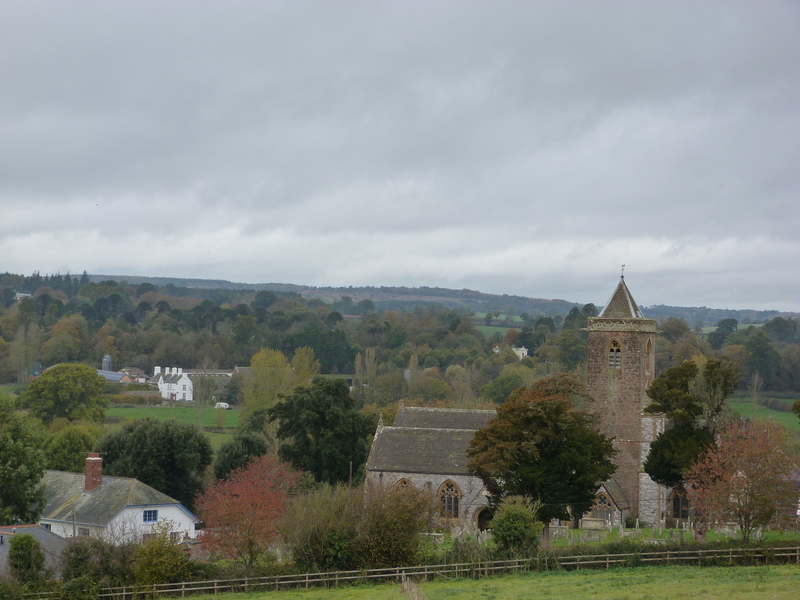 Ashburton is on the edge of Dartmoor National Park, and we had hoped that there would be a good walk to near-by Buckfastleigh. 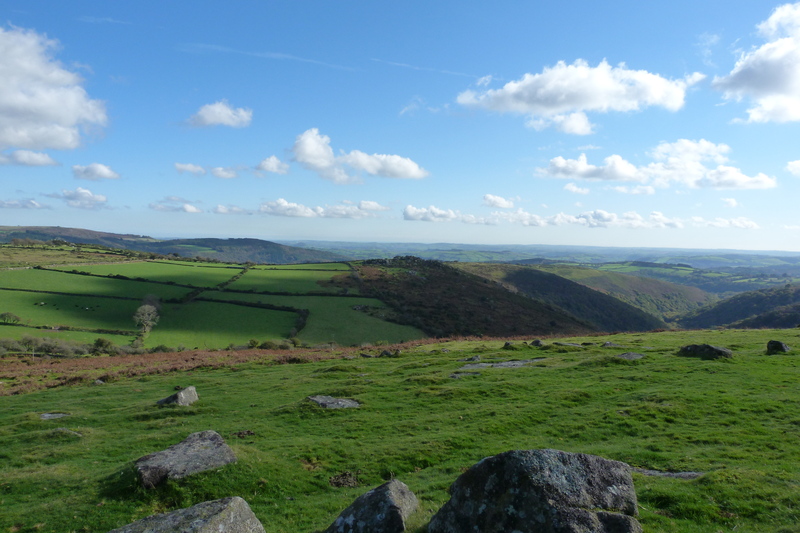 But the only paths were along the highway, so Pip drove us instead to Dartmoor for a brief walk. This moor-ish adventure was quite different from our experience in Bodmin. The sunshine helped a lot, but there is defnitely a bit more colour in the surroundings. There was almost a lushness to the landscape. That is, if something can be lush and desolate at the same time. 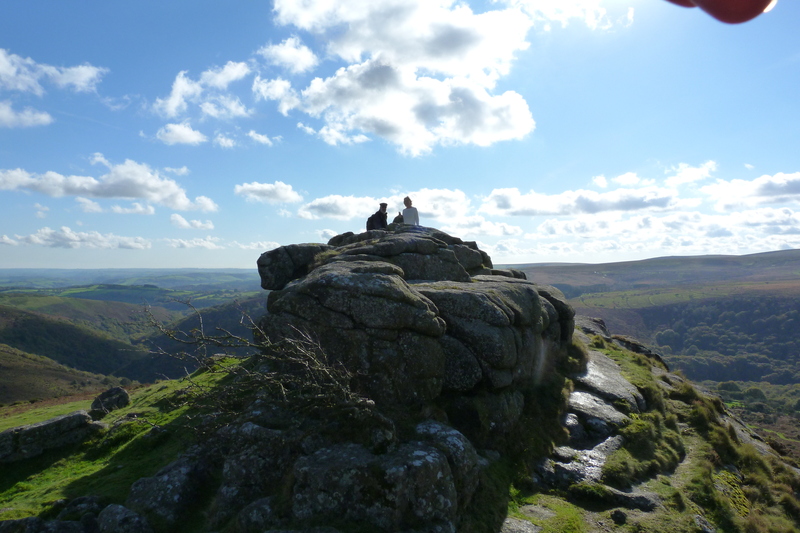 Dartmoor is enormous. Vast. Once you are in the park, there is moor in every direction. But really, there is not a lot of variety in a moor. A little bit goes a long way. So after a great walk with Pip and Alfie the dog, we were fine to move on. Pip dropped us in Buckfastleigh, a tiny town of about 3,600 that used to be a wool-producing centre. 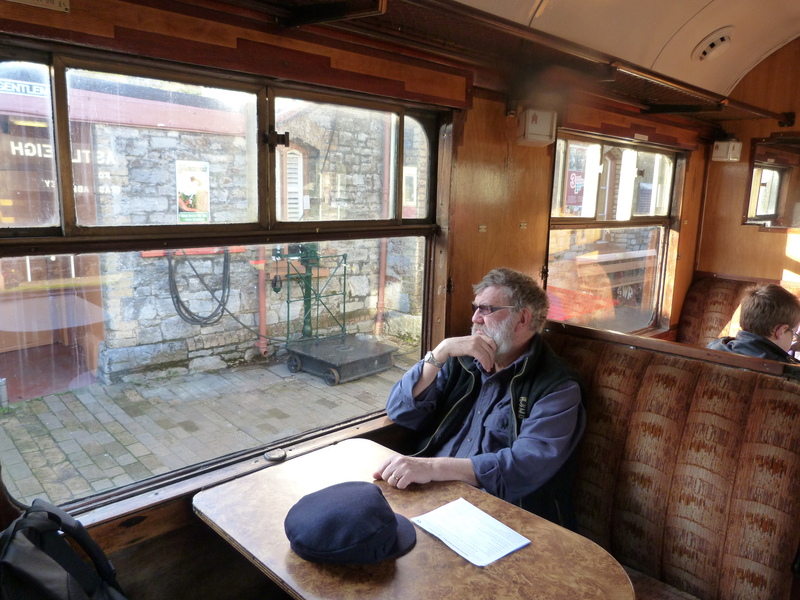 Now, however, the main attraction of Buckfastleigh (other than that the name uses half of the letters of the alphabet, and each only once) is the South Devon Steam Railway. 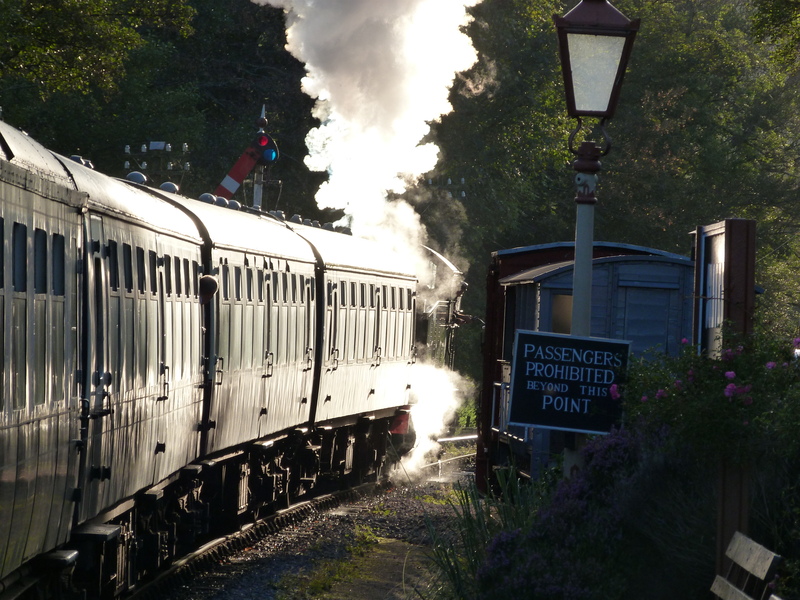 This lovely steam train runs from Buckfastleigh through Staverton to Totnes and having just seen the “Railway Children” in London, we wanted a chance to experience this adventure first hand. 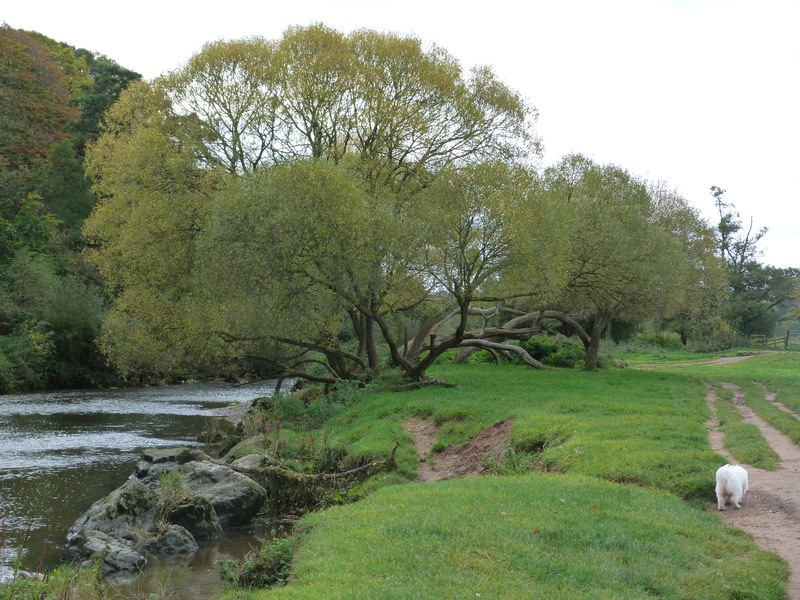 The train hugs close to the river Dart on a former Great Western Railway branch line through the Devon countryside. Filled with train enthusiasts and excited children, we chugged along, steam pouring from the engine’s chimney and the train literally making a “Choo-choo” sound. I stuck my head out the window to watch the sunshine on the steam, the image from so many classic movies. And yes, I got a bit of soot in my eye just as they say you will if you stick your head out of the window to watch the train. But it was worth it for the chance to step back in time.